Wallace Chevrolet > 2018 Enclave > 2018 Buick Enclave – 9 Reasons It’s A Game Changer! 2018 Buick Enclave – 9 Reasons It’s A Game Changer! 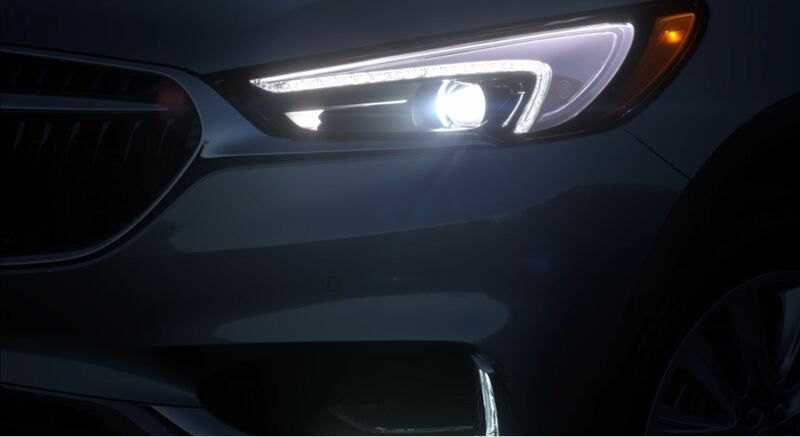 Evonik LED headlamps create a signature look in the dark. 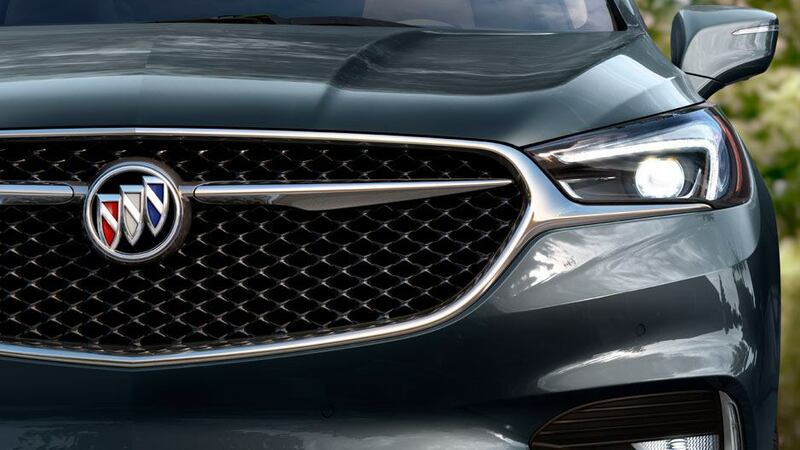 The new Buick Enclave has officially arrived at Wallace Chevrolet here in Milton, Ontario and right from the get-go it’s clear this new top-tier Buick has REALLY upped its game. 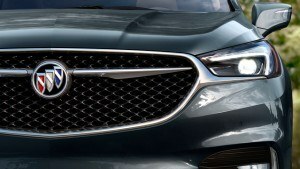 Here are nine reasons why it’s truly a game-changer for the Buick brand. 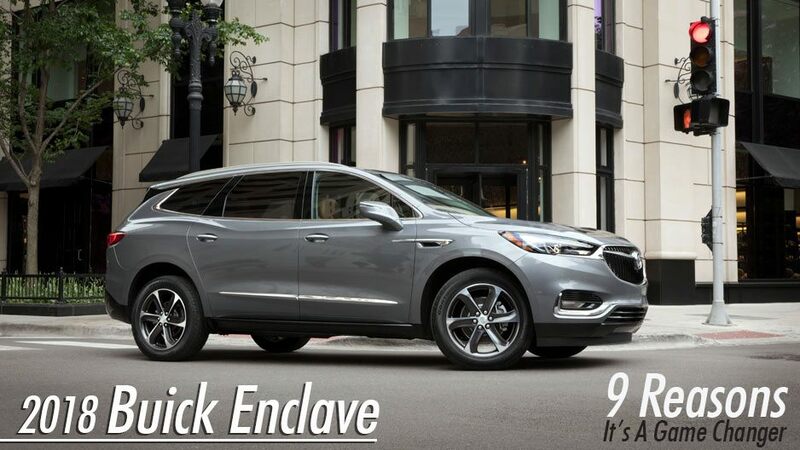 Buick has shaped Enclave into a whole new beast. Now lower, slimmer and longer the new model looks taut and distinctive, especially with the optional 20-inch wheels. Our favourite: The LED Evonik signature headlamps that brilliantly cut the night. However, the interior is where Enclave really shines. The frameless 8″ touchscreen display looks fantastic, and is paired with Android Auto/Apple CarPlay (all standard). 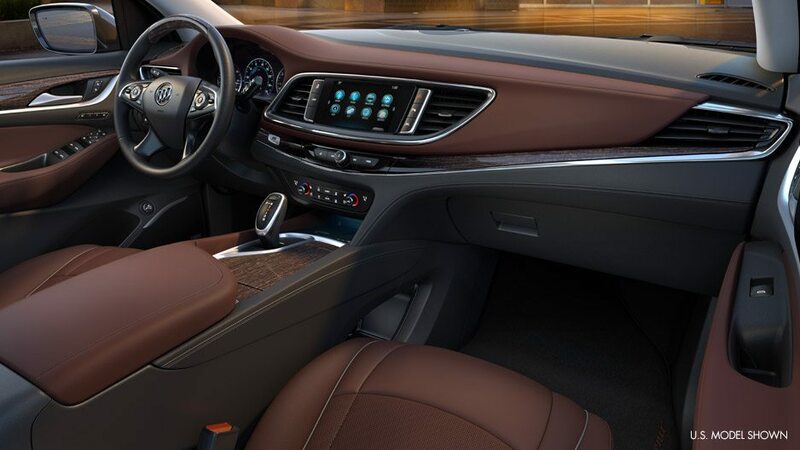 Did we mention the available leather seating, wood tones and chrome accents? Our favourite: All your favourite apps at your fingertips. The all-new interior truly makes Enclave special. Thanks to available features like a Surround Vision, Rear Cross Traffic Alert and Forward Collision Alert you can drive with confidence. Our favourite: Once experience with the Surround Vision camera and you’ll wonder how you lived without! Entry and exit couldn’t be easier as third row occupants simply slide the 2nd row seats forward with an integrated handle. And thanks to power-folding third-row seats you can raise and lower the seats on a whim with the touh of a button. Our favourite: No more reaching awkwardly to fold the rear seats, simply press and go! Surround Vision gives you eyes where you can’t see- from above! When you’re loaded up with bags it’s just plain inconvenient to have to set them down, especially in winter. The new Hands-Free liftgate prevents all that with a simple kick of your foot. Wave it below the rear sensor and up goes the trunk! Our favourite: No more worrying about your bags getting covered with slush & snow! 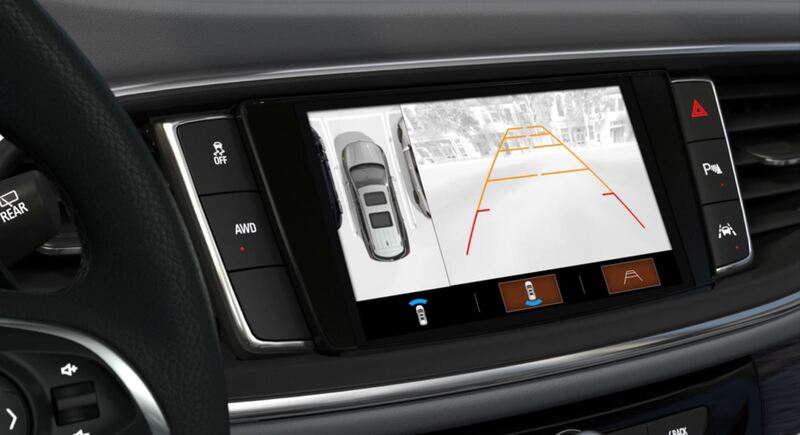 There is no “base” model- even the Essence model is packed: heated front seats, rear vision camera, rear park assist, remote vehicle start, tri-zone climate control, nine-speed transmission, 8″ screen and 4.2″ driver information centre, lane change alert and more. Our favourite: Standard hands-free liftgate! Thanks to brilliant design the new Enclave looks more taught and tight, but actually delivers MORE space inside! The third row boasts 5.6-inches more standard legroom than an Acura MDX (4.5 more than Audi Q7, three inches more than Infiniti QX60). In fact, overall interior space has increased by 10 percent! Our favourite: 10″ deep underfloor dry storage! Avenir ups the ante with unprecedented levels of luxury and sophistication. 8. The Sound of Silence Drive the new Buick Enclave and you’ll notice just how quiet it is, thanks to triple-door seals, inner door sound barriers, engine-side acoustics, acoustic windshield and glass and suspension tuning designed to reduce noise! Our favourite: Buick leads GM in its quest for ultimate in-cabin silence! 9. Step up your game with Avenir The new top-level Avenir model enhances Buick Enclave inside & outside: Black ice grill with chrome wings, 20″ Pearl Nickel finish wheels, Chestnut & Jet Black interior theme with real wood, wireless charging mat, 8-inch reconfigurable Driver Information Display, available Continuously Variable Real-Time Damping, and more!